Punjab Education Minister O.P. Soni today said that Punjab Government is committed to uplift the level of education in the state so that Punjab's educational system can play a major role in the country. He was addressing the gathering in maiden district level 'Samarpan' function here. He said that the Capt. Amarinder Singh led Punjab Government will leave no stone unturned to facelift the education System.Lauding Samarpan project started in the district, the education minister said that such an initiative should be started in the entire state. He categorically said that with our joint efforts the level of education could be high and existing education system could be made at par with present scenario. He also announced that Punjab government to contribute equivalent amount in 'samarpan’ project with the tune of collection of donation from the district. Announcing a grant of Rs.5 lakh for Samarpan, he himself got membership of with his family. Mr. Soni said that he would soon visit the schools in the state and those were found to be deficient, would be punished, while best performing teachers would be admired. He said that there is a need for a good and quality education and therefore, where state government is concerned, the teachers should also be dedicated towards their duty and contribute with diligence and hard work.Addressing the gathering, Industry and Commerce Minister Mr. Sunder Sham Arora said that this samarpan is a unique initiative and new thought of deputy commissioner and district education department, in which every citizen could be contributed for the community service. He reiterates that the state government led by Chief Minister Capt. 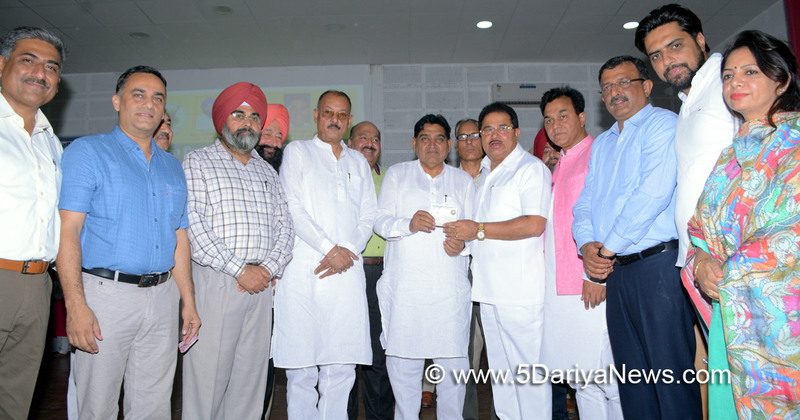 Amarinder Singh is focusing on health and education so that quality education and better health facilities could be provided to the students as well as to the citizens of the state.Earlier, the deputy commissioner Mr. Vipul Ujwal said that about 17,000 beneficiaries have been nominated as members of samarpan under the umbrella of district education department. He has apprised that with the donation of one rupee a day by the donors, about 60 lakh rupees have been collected so far and with this donation, basic facilities like; desks, ROs, fans, green board, main gate and first-aid boxes would be provided to the government schools of the district.Education Minister, Mr. O.P. Soni handed over the items for the schools under 'Samarpan' to district education officers. He also honoured meritorious students of the 9th and 12th class of government schools besides honouring special children for their contribution at state level sports tournaments.Seth Naresh Agarwal and Seth Satish Agarwal have also announced donations of Rs.2 lakh each under samarpan.Earlier, the Education Minister was given the guard of honor by district administration at PWD Rest House.On the occasion, MLAs Mr. Rajneesh Kumar Babbi, Mr. Arun Kumar Dogra, Dr. Raj Kumar and Mr. Pawan Kumar Adiya, SSP Mr. J. Elanchezian, ADC Mrs. Anupam Kaler and President youth Congress Punjab Mr. Amarpreet singh were also present.